Private collection, Genoa. Probably (Arthur Sambon, Paris), by 1929. Benno Geiger, Vienna. (Count Alessandro Contini-Bonacossi, Florence); purchased 1939 by the Samuel H. Kress Foundation, New York;gift 1943 to NGA. According to a note on the back of a photograph, NGA photographic archives. Alessandro Magnasco, Galerie Sambon, Paris, 1929. Masterpieces of Art. European & American Paintings 1500-1900, New York World's Fair, May-October 1940, no. 34. Paintings by Alessandro Magnasco, Durlacher Brothers, New York, 1940, no. 1. Alessandro Magnasco 1667-1749, Civico Museo d'Arte Contemporanea, Palazzo Reale, Milan, 1996, no. 42, repro. The support is a medium-weight, plain-weave fabric. It was prepared with a grayish white ground, over which was applied a reddish brown imprimatura. 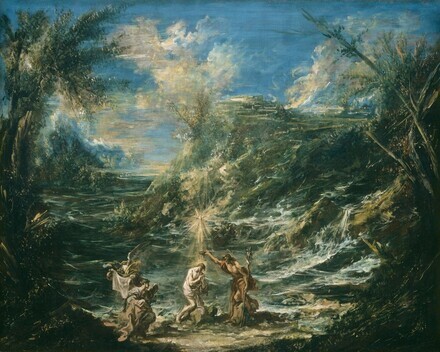 A thin layer of dark brown paint was used to lay in the lower landscape, and then the figures and other elements were roughed in over it using unblended strokes of white paint. After the figures were completed, thick swaths of paint were applied with random strokes in the landscape area. Finally, impastoed highlights and details were added. The reddish brown imprimatura shows through in the sky and landscape, where it serves as a middle tone. The original tacking margins have been removed, but cusping is present along all four edges. There are losses and abrasion throughout. The yellowed varnish is generally thick but thinner in lighter passages. The painting was relined in 1940 by Stephen Pichetto. Discolored varnish was removed and the painting was restored first during the 1940 treatment and, most recently, in 1959 by Mario Modestini. Preliminary Catalogue of Paintings and Sculpture. National Gallery of Art, Washington, 1941: 119, no. 528. Book of Illustrations. National Gallery of Art, Washington, 1942: 250, repro. 142. Morandotti, Alessandro. Cinque pittori del settecento. Rome, 1943: 71. Geiger, Benno. Saggio d'un catalogo delle pitture di Alessandro Magnasco. Venice, 1945: 88. Evans, Grose. "The Subtle Satire of Magnasco." Gazette des Beaux-Arts, 6th ser., 32 (1947): 42, figs. 1, 3. Geiger, Benno. Magnasco. Bergamo, 1949: 87, 152-153. Cairns, Huntington, and John Walker, eds., Great Paintings from the National Gallery of Art. New York, 1952: 70, color repro. Paintings and Sculpture from the Samuel H. Kress Collection. National Gallery of Art, Washington, 1959: 237, repro. De Logu, Giuseppe. La natura morta italiana. Bergamo, 1962: 126. Dürst, Hans. Alessandro Magnasco. Teufen, 1966: 24, 104, fig. 31. European Paintings and Sculpture, Illustrations. National Gallery of Art, Washington, 1968: 71, repro. Fredericksen, Burton B., and Federico Zeri. Census of Pre-Nineteenth Century Italian Paintings in North American Public Collections. Cambridge, Mass., 1972: 117. Shapley, Fern Rusk. Paintings from the Samuel H. Kress Collection: Italian Schools, XVI-XVIII Century. London, 1973: 112, fig. 210, 214. European Paintings: An Illustrated Summary Catalogue. National Gallery of Art, Washington, 1975: 208, repro. Franchini Guelfi, Fausta. Alessandro Magnasco. Genoa, 1977: 132-134, repro. Shapley, Fern Rusk. Catalogue of the Italian Paintings. 2 vols. National Gallery of Art, Washington, 1979: I:293-295, II:pl. 207. Grigoriva, Irina, and Asja Kantor-Gukouskja. I grandi disegni italiani delle collezioni dell'Ermitage di Leningrado. Milan, 1984: cat. 59. Walker, John. National Gallery of Art, Washington. Rev. ed. New York, 1984: 344, no. 469, color repro. European Paintings: An Illustrated Catalogue. National Gallery of Art, Washington, 1985: 241, repro. Franchini Guelfi, Fausta. Alessandro Magnasco. Soncino, 1991: 24. Muti, Laura. Alessandro Magnasco. Faenza, 1994: 267, nos. 390, 391 (repro. ), as by Magnasco and Peruzzini. De Grazia, Diane, and Eric Garberson, with Edgar Peters Bowron, Peter M. Lukehart, and Mitchell Merling. Italian Paintings of the Seventeenth and Eighteenth Centuries. The Collections of the National Gallery of Art Systematic Catalogue. Washington, D.C., 1996: 178-184, color repro. 180. Grande Pittura Genovese dall'Ermitage da Luca Cambiaso a Magnasco. Exh. cat. Palazzo Ducale, Genoa. Saint Petersburg, Genoa, and Milan, 2002: 142. Hand, John Oliver. National Gallery of Art: Master Paintings from the Collection. Washington and New York, 2004: 243, no. 194, color repro.